One thing to clarify from Part 1: when we speak of power dissipation, this is not the power output available to the speaker. Tubes are inefficient creatures; the output power will always be significantly less than the tube(s) will dissipate, i.e. consume. Think of dissipation as absorbed power, not all of it can be transferred to the speaker, the same way not all power produced by an automotive engine is transferred to the wheels. The other common type of output tube biasing is cathode bias. This type of bias is sometimes referred to as self bias, or a few other “marketing speak” terms. I don’t mean to disparage cathode bias, but sometimes the language amp manufacturers conjure up does tend to cloud the fact that this method of biasing does not allow user adjustment. Cathode bias also tends to run tubes a little bit less than the “magic” 70% dissipation discussed in part 1. This is to provide a margin for tube variability, so that no tube, within production variations, will draw too much current and therefore approach the upper limit of its power dissipation. However, just because an amp does not have user adjustable bias does not necessarily make it a cathode-biased amp. A few amps, usually very pricey ones from high end manufacturers, have active bias monitoring and adjustment. These typically do not have user adjustments, but are fixed bias amps. The “fixing” is performed by a microprocessor without any user involvement. Other active fixed bias amps that are designed to work with a wide variety of output tubes may include a switch to optimise the “family” of tubes the end user prefers. One position will set the bias adjusting mechanism for EL34/KT77 tubes, whereas the other switch position might optimise for 6550/KT88 tubes. Now back to cathode biasing. Though less intimidating than the ARC amp pictured in part 1, the amplifier shown above can still bite if you are not careful. This amp is also pictured in My Audio Life no. 7. It’s based on a design published on the Angela Instruments website some years ago. The output section is shown in the schematic below. 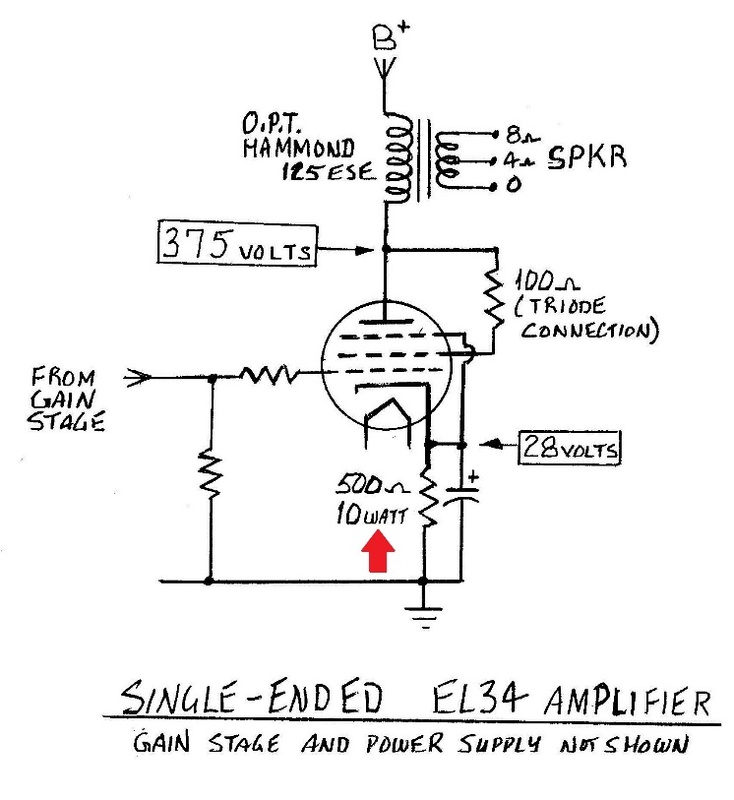 This is a single-ended (non-push pull) amp that uses an EL34. Alhough it’s a pentode, the EL34 here is connected in triode configuration with a 100Ω resistor. 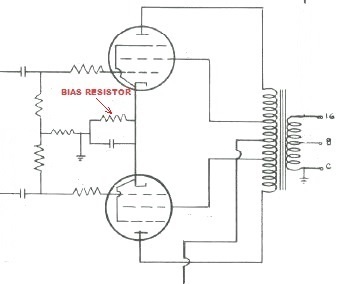 If you compare this schematic to the one shown in Part 1, you’ll see that there is no separate bias supply and no variable resistor to adjust bias. The 500 ohm resistor (red arrow) connected between the cathode and ground, controls the current flow through the tube, thereby setting the bias. In this instance, calculating the current flow through the tube and the dissipated power is easily done – the circuit designer has thoughtfully supplied the nominal voltage and component values needed. An inside view of the amp pictured above and in the schematic can be seen below. Using the power formula from Part 1, we can calculate the tube’s dissipated power. For the voltage we must subtract the voltage (see schematic) on the cathode, 28 volts, from the voltage on the plate, 375 volts = 347 volts. 19.4 watts calculated dissipation is about 60% of the maximum permissible, of 3 and 4 added together (32.5 watts). So can we crank it up for better sound? The short answer is no, there’s nothing to crank (adjust). The longer answer is yes, if we want to change out the 500 ohm resistor for other resistors until the desired power dissipation is found. In this case, I wouldn’t start changing out resistors. The reason being, when pentode tubes like the EL34 used here, are triode-wired, they typically won’t dissipate as much power as they will in pentode or ultralinear mode. As well, production variations in tubes, as mentioned above, dictates a little extra margin of safety when cathode biased. If you are the type that’s not bashful about using a soldering iron and are comfortable around high voltages, then changing out bias resistors is a potential possibility. In the example above, and assuming the power supply and output transformer is up to the job, it might be possible to swap out resistors to increase the current draw to work more optimally with a 6550 or KT120. On the other hand, say you have a favourite KT66 or 6L6 (their max. dissipations are less than the EL34), then by changing out the bias resistor the amp could be optimized for a bit less current draw on the output tube. Now you might ask, “What’s the point of cathode bias if I can’t easily change it?” Well, cathode bias has the advantage of being plug and play. If you are the type that is disinclined to get involved enough to buy a multimeter and adjust things in a live component, then a cathode bias amp might be your best choice. If you have a cathode biased amp and you are inclined to measure it live, then you can check the cathode voltage (the 28 volt value in the schematic above). If this voltage is significantly different, say more than a 20% deviation from the nominal, then you might have an aged tube that needs replacing. Also, if there’s a large difference from one channel to the other, it’s an indication that one of the tubes might be out of spec. Running the measured voltage through the current and power calculations shown earlier, will give you a feel for the health of your tubes, assuming everything else in the amp is OK. In the schematic below, both output tubes in this push-pull amp share one cathode resistor. This makes it difficult to determine if one tube is weaker than the other. The current draw through the resistor is the aggregate of the two tubes. In this instance, it’s best to buy a matched pair of tubes, and hope that they age in a similar manner. If you are inclined, measure the voltage across the bias resistor when a new set of tubes has been installed – well actually wait a few hours until the tubes have had a chance to settle in. From time to time check the voltage and when it has wandered off from the initial value by say 20 to 25%, it’s probably time for new tubes. Push-pull tube amps work best, i.e. have the lowest distortion, when both of the output tubes draw the same current, as this balances the two “sides” of the output transformer’s primary winding. Advantage fixed bias amp, provided you are prepared to do some measuring and adjusting. 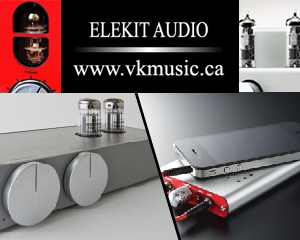 A true auto bias amp, or a semi-auto one like the Elekit TU-8340, will take care of the balancing for you. I think you know the type of amp I’d choose to buy, but I’m old-school and not afraid to do a little measuring and adjusting. As mentioned previously, I don’t mean to disparage cathode bias amps. There are very good sounding classic amps, and modern amps too, that employ cathode bias. You must choose according to the amount of involvement you feel comfortable with. Let your ears be the final arbiter when choosing an amp, or any audio component for that matter. Generally speaking, it’s much easier to substitute tubes in a fixed bias amp than it is one with cathode bias. The best source of information is the owner’s manual or the manufacturer’s website. The dealer where you purchased your amp might be able to offer a recommendation based on his experience or the experience of other customers. -EL34’s and KT77’s are more or less interchangeable. -6550’s and KT88’s are more or less interchangeable. If an amp is designed for the new power tube darling, the KT150, then chances are plunking in your treasured set of NOS Telefunken EL34s could have tragic consequences. If an amp is designed for, say, a KT66, then plugging in a set of KT150s will not likely hurt the tubes, but could put serious stress on the amp, especially the power transformer. Even if no damage is done, the bigger tubes might not run optimally and actually sound worse than smaller (and less expensive) tubes. See my power tube shootout for more thoughts on auto bias, fixed bias amps. 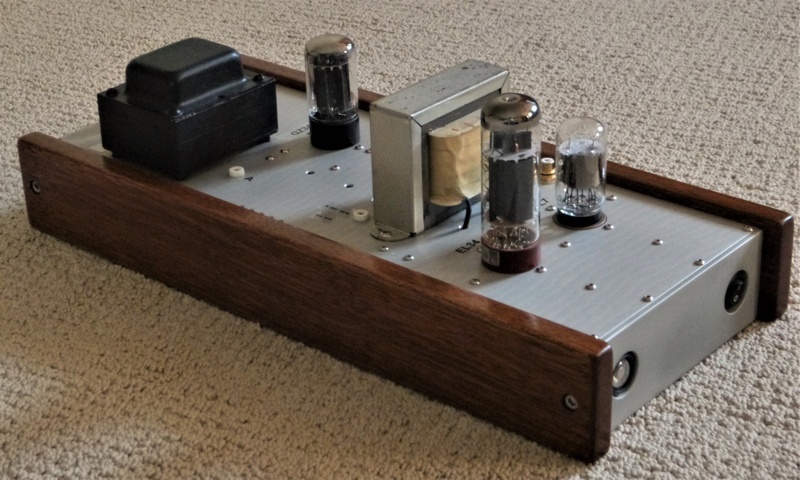 Old-school, manually-adjusted, fixed biased amps like my Audio Research Reference 110, or Parks Audio Eiclone, are, generally speaking, more amenable to tube substitution. The reason being that bias can be set to whatever the user wants or thinks will make the output tubes sound their best. Check with the manufacturer, dealer, or a trusted tube seller to tap their experience. Or turn to the internet, there’s always some idiot with an opinion. Oops, I mean, some idiot other than me. If you are wondering how the pictured single-ended amp sounds, well, so do I. These might, on a good day, put out about 5 clean watts. Using them with my current hungry floor standing PSBs is out. I think I’ll give them a try with my little Wharfies. I’ll get back to you. Enough talk about tubes. Let’s switch our on stereos and enjoy some music.